Do HydroEdge tires live up to their name? Michelin Tires HydroEdge radial is touted as the premium All-Season passenger tire for Family sedans, minivans, and coups. Developed as a versatile tire, the Hydroedge combines a high level of hydroplaning resistance along with construction said to provide long wear. Also noteworthy is the whopping 90K mile warranty offered by Michelin. Michelin Tire also promotes the HydroEdge as commanding a great deal of traction in light snow. This tire is rated as 'T' for most sizes, which has caused some potential purchasers to shy away. See our tire speed rating guide for more info in this area. The outside of the tire features a 'silica-enhanced' compound that is molded into a tread design to bring a superior handling in both dry and wet conditions, while delivering a long tread life. Water is pumped from under the tire by angled "HydroChutes" and center grooves. This increases a resistance to hydroplaning. A polyester cord body and twin steel belts of the HydroEdge offer a smooth ride, durability, and strength. According to Michelin Tires, HydroEdge tires last as much as 33K mils longer than comparable tires. Force of acceleration, cornering, and breaking are evenly distributed by a distinctive contact patch shape. 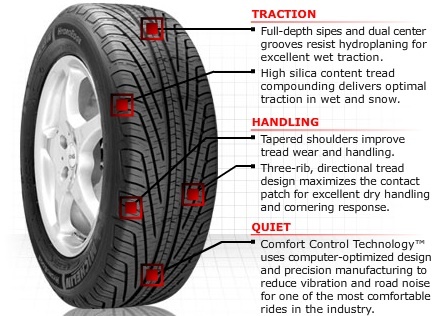 Compared to other tires in this category, Michelin states that the HydroEdge has the highest level of fuel efficiency. This is because of the EnergySaver Construction that results in less effort required from your engine. Breaking is said to be much better with the Michelin HydroEdge as well. A wide center groove and a silica-based compound design increases the grip enough to boast as much as 14 fewer feet of stopping distance then the competition. The HydroEdge scores high marks for traction in wet conditions, superior tread life, and a smooth ride. "Amazing grip in wet and dry conditions; Unbelievable warranty"
"I have found the resistance to hydroplaning to be amazing. I frequently drive in moderate to heavy rains..."
"HydroEdge tires have exceeded my expectations ...traction in wet conditions was superior... driving in snow (as much as 12" of snow in a day) was fantastic! Great traction during acceleration, and braking in snow and ice is improved as well." "Holds remarkably well in wet conditions and during heavy rains, even above speeds limits." "Got 60000 miles on the Michelin HydroEdge and was very happy... probably could have gotten another 10K miles on them"
"A year after owning these tires they still handle better than anything I've driven in over twenty years. Snow, desert, or rain they still impress me with unbeatable traction and outstanding wear." "Unfortunately, the HydroEdge have a considerable amount of road noise. This is likely the result of the tread blocks and rubber compounds. The payoff however is that the traction is very good." "A drawback to the HydroEdge is sacrificing a smooth ride for traction"
"Very noticeable road noise and not so comfortable for freeway trips"
"I'm a little disappointed to find that the HydroEdge ride no better than the Cooper Lifeliners I had before"
Priced at roughly $150.00, and with such an outstanding warranty from Michelin, the HydroEdge could be a great tire for those that live in areas that get a lot of rain. The reviews appear to support the claims by Michelin that the tires last quite a long time, of course they wouldn't have such a warranty otherwise. Keep in mind that the Michelin HydroEdge tires are a bit noisy because of the features to reduce hydroplaning and maintain tread. Far better than the rest!